The chances of being able to correlate items of philately from different disciplines maybe one of happenstance or coming to finality over a period of time. It is especially challenging if the correlated items are from remotely different categories. Taking for example the PRIVATE MAILING CARD shown in Figure 1. It was mailed with a one cent stamp (Scott 279) and is postmarked by a straight-line machine cancel of Indianapolis, Ind, dated (Feb.) 27, 1900 and is addressed to Le Banon, Junction, Ky. The PMC inscription was still required on privately produced postcards as it wasn’t until Dec. 24, 1901 when they were permitted to use POSTCARD as the inscription leaving a window of just over three years for the PMC heading. The message side of the card has a printed format message to which the sender inserts the needed information, in this case typing it. 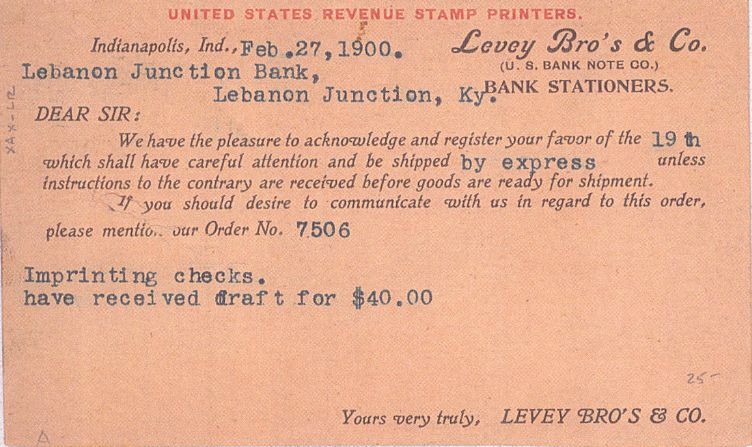 The card was sent by the Lovey Bros. & Co. (U.S.Bank Note Co.) with their business being Bank Stationers. Figure 2. The message states that the order for the imprinted checks was shipped by express for which they had received a draft of $40.00. 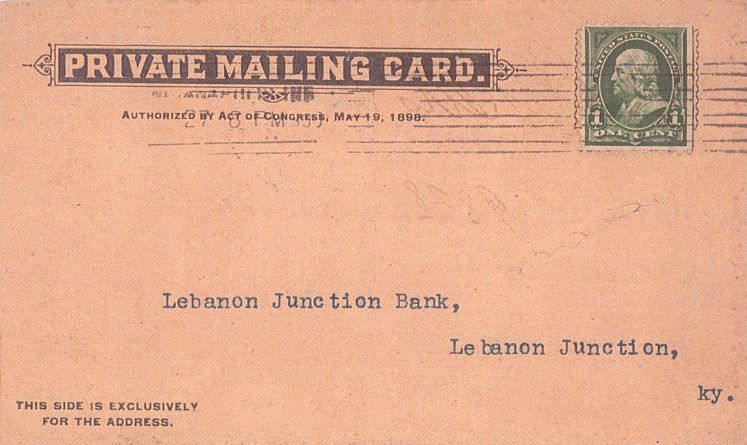 The Lebanon Junction bank of Lebanon Junction, Ky. had ordered the checks which at that time (1900) required an Internal Revenue Tax to help pay for the Spanish-American War. The really interesting aspect of the postcard is at the top of the message on the back and printed in red is the following statement, which appears to have been printed after the original printing. So it seems like Lovey Bros. & Co. not only printed the checks but also imprinted the Internal Revenue Documentary Tax stamp on the check as well. The 2006 edition of the Scott Specialized Catalogue of United StatesStamps, under the category of Revenue Stamped Paper, lists the group SPANISH-AMERICAN WAR SERIES as the documentary stamp Type X. The text at the front of the section states the Type X was printed by regional printers under contract with the government. An example of this type of use is illustrated by the check shown in Figure 3 of THE FIRST BANK OF FAIRFIELD/FAIRFIELD, IOWA. The two cent orange stamp (Scott RN-X7) is imprinted on the check. In addition, at the lower left appears Dennison & Sons, Lith. 2 Liberty St., N.Y. So taking into account the statement made at the top of PMC card it would appear that Lovey Bros. of Indianapolis, Ind. were also under “subcontract” to imprint the two cent documentary stamp on the check, since the card has under their heading (U.S. Bank Note. Co.). Contacting Eric Jackson of Leesport, PA resulted in his checking a data base to determine if they had a listing for a two cent Spanish-American War documentary stamp on a check printed by Lovey, but was unable to verify it. So the question remains: is there a check with the notation that Lovey Bros. & Co. had under a subcontract to the U.S. Bank Note.Co. actually printed the two cent documentary stamp (RN-X) on the check, much like the one shown in Figure 3? This would climax the correlation of the Lovey PMC and a two cent Internal Revenue Documentary Stamp on a check and printed by Lovey in the time frame of the Spanish-American War period tax. A somewhat confusing statement at the beginning of the listing in the 2006 edition of the catalog is that it notes that many of the stamps were used for the railroad parlor car tax, although it appears that the majority of stamps were printed on checks. Another consideration is the statement that the illustrations may not be true to size but that the actual size in millimeters is noted with the listings. In the case of the Type X stamp shown on the check in Figure 3 is 68 x 36mm; while the catalog states the actual size is 68 x 38mm leaving a difference of 2mm. So the question might be: is the catalog size wrong for the Type X stamp or are there two different sizes for the Type X stamp for the one cent and two cent values. What all this brings out is that there can be more to correlating two different items of philatelic collectibility than just a reference to one another. So in this context let the chase begin for a Lovey Bros. & Co. printed check with an imprinted documentary stamp (Type X)!